Since 2008, when A2B designed the first true e-bike for the A2B range, the intention was to create a mode of transportation in its own class, so not just adding a battery on a bicycle, which would seriously hinder the design, stability and look of the product. Six years on, the Obree is one of a new generation of e-bikes, with a much more streamlined look and is also lighter in weight. Inspiration for refining our e-bikes, therefore, comes from the desire to incorporate the latest design techniques in order to improve weight, stability and look, but also take into consideration the size and cost requirements of navigating increasingly congested cities and the rising cost of transportation. With the Obree, we achieved this by using new manufacturing methods and doing detailed work on the frames. Not only were we able to then reduce the weight, but by using a process called hydroforming, we were able to produce the seat mast in just one piece, making it much stronger and more robust. We also made significant adjustments to the system and components. 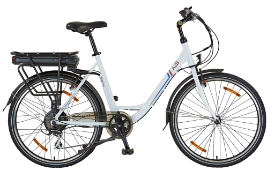 As more and more countries continue to urbanise, and the population continues to expand, e-bikes will become a stronger part of the electric vehicle mix because they are small, nimble, cleaner than other forms of transportation and hugely cost effective, providing the basis of much inspiration to come.